impact basin-lower right, and the Mars Atlas). 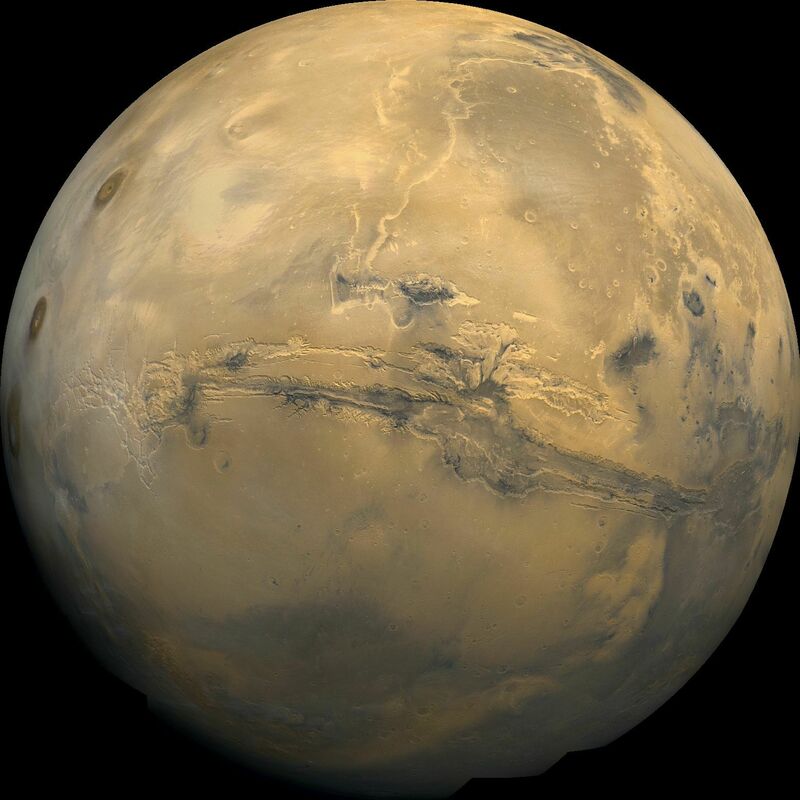 On May 30, 2012, scientists published a paper suggesting that a large portion of the atmospheric methane detected on Mars may have been generated by ultraviolet radiation of fallen carbonaceous meteorites. 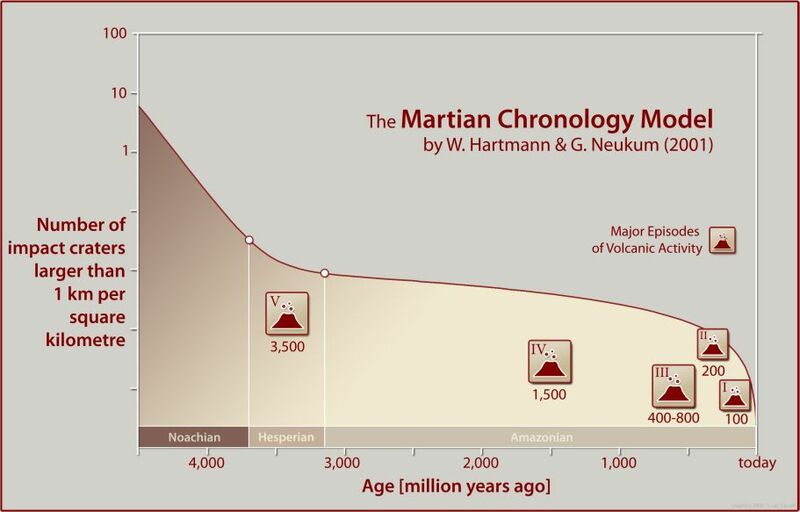 They based their hypothesis from experiments using samples from the Murchison meteorite (which has a high carbon content), which gave off methane when exposed to levels of ultraviolet radiation equivalent to sunlight falling on Mars' surface and varies seasonally and by latitude (matching the observed methane). As Mars experiences a higher rate of meteorites landing on its surface, the scientists provide a non-biological explanation for much, if not most, of its detected methane (University of Edinburgh press release; and Keppler et al, 2012). The fourth planet out from Sol is located at one and a half times the Earth-Sun distance. It has only about 11 percent of the Earth's mass and just over half of its diameter. Mars is often referred to as the "Red Planet" because its surface rocks and soil are colored by oxidized iron minerals (e.g., rust), and dust blown into its thin atmosphere makes its sky look reddish as well. 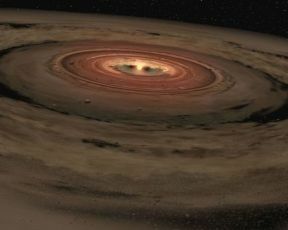 On June 5, 2011, a team of scientists published an article in the journal Nature which explains how early orbital in-migration by Jupiter (and Saturn) would have depleted the circum-Solar disk of dust and gas at the orbital distance of Mars so that the Red Planet had less mass to develop from. In the Grand Tack Scenario, Jupiter moved inward to settle for a while at Mars' orbital distance of 1.5 AUs before the Red Planet had developed after forming initially at around 3.5 AUs. Subsequently, depletion of gas and dust in that region of the circum-Solar disk allowed Jupiter to migrate back outward to their 5.2 AUs, and Saturn to around 7 then 9.5 AUs (NASA and GSFC news release; SWRI news release; and Walsh et al, 2011). Larger and jumbo illustrations (source). to its stunted size (more). Today, what little atmosphere Mars is able to hold on to is composed primarily of carbon dioxide (over 95 percent) with small amounts of other gases (including 2.7 percent nitrogen, 2.7 percent argon, but only 0.13 percent oxygen). Barometric pressure varies slightly between about 7 and 11 millibars in the northern and southern hemispheres as carbon dioxide freezes out to form an immense polar cap at the pole then in Winter, which evaporates in Spring. In contrast, the average atmospheric pressure on Earth is about a hundred times greater at around 1,000 millibars. However, Mars' atmosphere is thick enough to support strong winds and vast dust storms that can blanket the entire planet for months. Its thin atmosphere produces a greenhouse effect that is only enough to raise surface temperature by 5 degrees Celsius (2.8 �F), much less than what occurs on Venus and Earth. Mars once may have had an atmosphere as dense as Earth's. On November 21, 2008, however, researchers announced new evidence that the atmosphere of Mars was and is still being stripped away by the Solar Wind. Although Mars has a weak magnetic field, it is very much unlike Earth's which is like a global bubble. 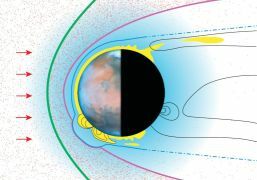 The magnetic field around Mars is in the form of magnetic umbrellas that emanate from the Martian surface and and reach beyond the top of its atmosphere. Numbering in the dozens, these umbrellas about 40 percent of the planet�s surface, mainly in the southern hemisphere. These umbrella fields can link with the magnetic field in the Solar Wind through "magnetic reconnections" so that the joined fields wrapped themselves around a packet of gas at the top of the Martian atmosphere to form a magnetic capsule a thousand kilometers wide with ionized air trapped inside. Subsequently, the pressure of the Solar Wind pressure can "pinch off" the capsule (or "plasmoid") and blow its load of air away into deep space (more). 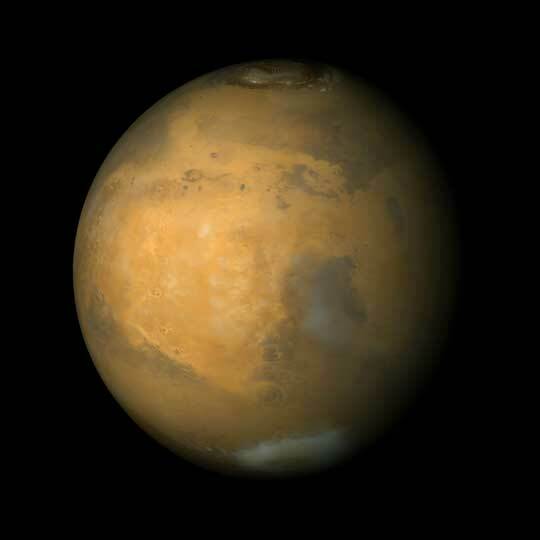 Mars's rotation produces a day just a little longer than an Earth day. However, it's more distant orbit around the Sun takes almost two Earth years and is also significantly elliptical ("eccentric"). As a result, surface temperature varies by about 30 �C (86 �F) between its closest and farthest approaches to the Sun (perihelion and aphelion). in April 1999 (more information). Although the average surface temperature is about -63 �C (-81 �F), it can range widely from as little as -133 �C (-207 F) at the winter pole to almost 27 �C (80 �F) during a local day in summer. Martian air contains only about 1/1,000 as much water as Earth, however, this small amount can condense out to form clouds that ride high in the atmosphere or swirl around the slopes of Mars' towering volcanoes. Local patches of early morning fog can also form in valleys, and a thin layer of water frost can cover the ground in winter (see morning clouds over the canyons of Noctis Labyrinthus at Astronomy Picture of the Day). 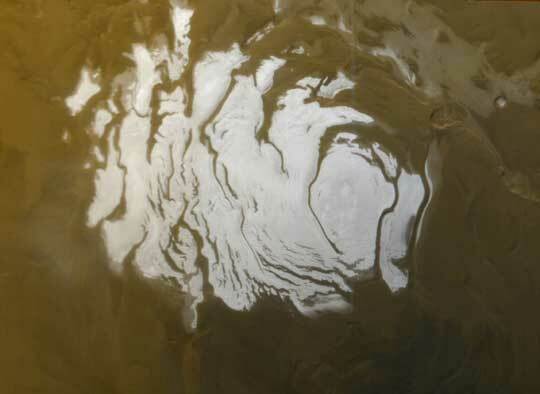 Mars has permanent ice caps at both poles composed of solid carbon dioxide ("dry ice") over a layer of water ice. The ice caps have alternating layers of ice with varying concentrations of dark dust. Seasonal variations in the size of the polar caps can change Mars atmospheric pressure by as much as 25 percent. In the northern summer, the carbon dioxide completely evaporates and uncovers its lower layer of water ice. The polar layering of water ice on Mars may be caused by climatic changes associated with long-term variation in the planet's axial tilt (its inclination relative to the plane of its orbit). 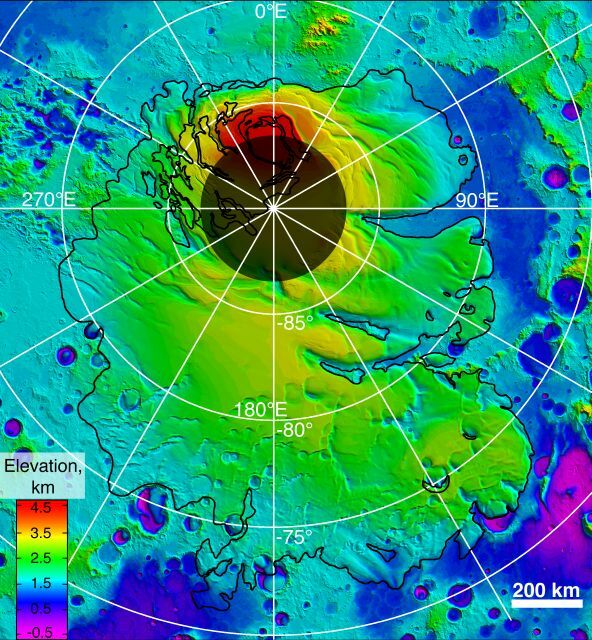 the poles, an ice-rich zone underneath contains 20 to 50 percent ice by mass. how deep the ice-rich zone may continue below that depth (more). In early 2002, the Mars Odyssey spacecraft detected extensive ice deposits in and around the southern cap -- south of 60� latitude in the southern hemisphere (more from NASA and LPL). 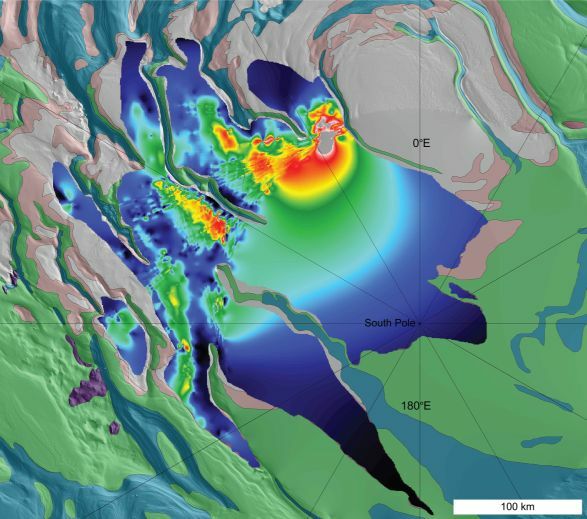 An ice-rich soil layer was found at about 60 centimeters (two feet) beneath the surface at 60� south latitude, which rose closer to the surface to within about 30 centimeters (one foot) at 75� south latitude. There may also be water ice hidden below the surface at lower latitudes. Detection of similar, extensive ice deposits at the North Pole was obscured by a winter layer of carbon dioxide. One estimate suggested that melting the amount of water ice found thus far would cover the planet with an ocean at least 500 meters deep (1,640 feet). South Polar Cap, and other polar images (more). of years like Earth's ice age cycles (more). On April 21, 2011, scientists analyzing ground-penetrating radar images from NASA's Mars Reconnaissance Orbiter announced their discovery of a huge deposit of frozen Carbon Dioxide ("dry ice" or CO2) buried near Mars' south pole. Estimated at 9,500 to 12,500 cubic kilometers (2,300 to 3,000 cubic miles -- the size of Earth's Lake Superior), the South Polar deposit is some 30 times greater than previously estimated and, if melted, would be sufficient to boost the present amount of CO2 in Mars' atmosphere by 80 percent, which is already 95 percent comprised of that gas. The planet's axial tilt (currently an "obliquity" of 25.2 degrees) can vary from 10 to 40 degrees over a cycle lasting as long as 100,000 years, which is much more than the Earth's Moon-stablized tilt of 23.4 degrees. As a result, Mars' atmosphere may have been much denser, stormier, and dustier some 600,000 years ago, and the planet could even have been wet in some locations, when its axial tilt placed its South Polar region closer to its equator. 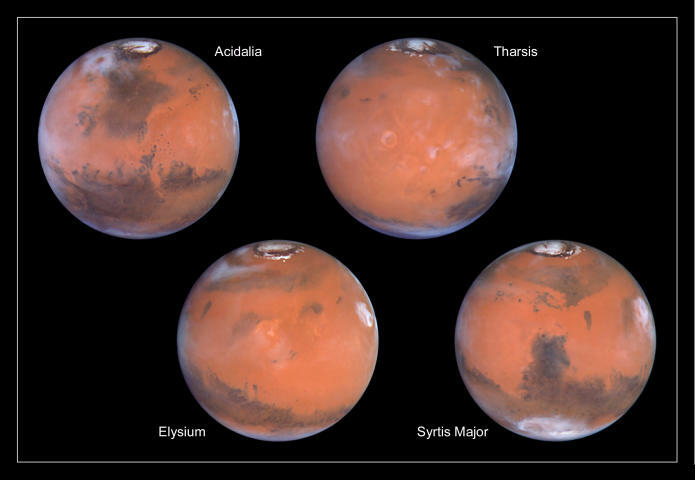 When Mars' axial tilt is lowest at around 10 degrees, however, the poles go dark and the whole atmosphere basically freezes out, and its CO2is redeposited as dry ice at the poles. Although some of Mars' ancient atmosphere has been lost to space and some of its CO2 has been lost to carbonate minerals in its crust, planetary scientists hypothesize much of the planet's supply of that greenhouse-warming gas precipated out as dry ice at its poles (NASA / JPL new release, more images; and John Matson, Scientific American, April 21, 2011). Larger and jumbo radar images (source). subliminated into its atmosphere (more). On March 15, 2007, the ESA announced that its Mars Express (working with NASA�s Mars Global Surveyor) spacecraft used a NASA-Italian Space Agency radar instrument to determine that there appears to be sufficent water ice at Mars' south pole alone to submerge the planet in 36 feet (11 meters) of water, if melted (news release). Ice deposits at the Martian south pole were found to be up to 2.3 miles (3.7 kilometers) thick and widespread enough to cover an area larger than Texas or much of Europe. The ice lies under a polar cap of white, frozen carbon dioxide and water. It appears to be composed of at least 90 percent frozen water, with dust mixed in. Mars Express is also surveying the composition and thickness of the planet's north polar cap. Although some scientists believe that the polar deposits contain most of the planet's known water and can cover the planet with a global layer perhaps tens of meters thick, the amount of water suggested in surface features (such as deeply eroded canyons) indicates that Mars may once have had enough water for an ocean that was hundreds of meters deep. 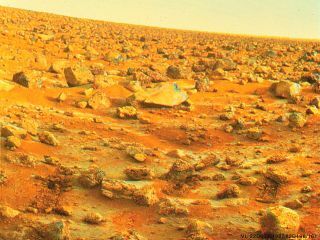 On June 26, 2008, NASA announced that its Phoenix Mars Mission dug up a soil sample from the top inch (2.5 centimeters) that is similar to surface soils found in the upper dry valleys in Antarctica on Earth. The soil is alkaline (pH of 8-9) with trace nutrients (salts of magnesium, sodium, potassium, and chloride) and so may be suitable for using as garden soil, if sufficient organic matter was added, for supporting bacteria and plants -- including vegetables like asparagus and turnips (more). Since its successful landing near the Martian north pole on May 25, 2008, the Phoenix lander has been studying the history of water and habitability potential of the Martian arctic's ice-rich soil. It is designed to search for organic evidence of ancient or current Earth-type life by digging up soil samples down to as much as three feet below the surface if it can scrape through subsurface ice (see the latest news from Phoenix). 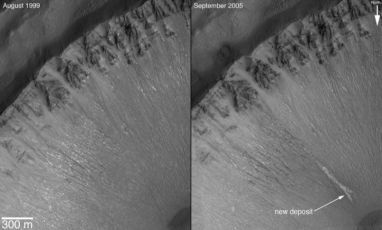 On December 6, 2006, NASA announced that evidence of liquid water erupting from just below the Martian surface had been imaged by the Mars Global Surveyor before it finally ceased operating in November 2006 (NASA new release and APOD). A number of observations, including the recent light-toned flows in the Centauri Montes Region and Terra Sirenum, indicate that a number of apparent "gully" sites show evidence of recent changes, providing tantalizing evidence for subsurface sources of liquid water. In particular, the two cases of new water flows may indicate the presence of aquifers (subsurface rocks saturated with water) that could be detected by orbiting, ground-penetrating radar systems on the ESA's Mars Express or NASA's Mars Reconnaissance Orbiter, which entered orbit around Sol's outermost rocky planet on March 10, 2006. 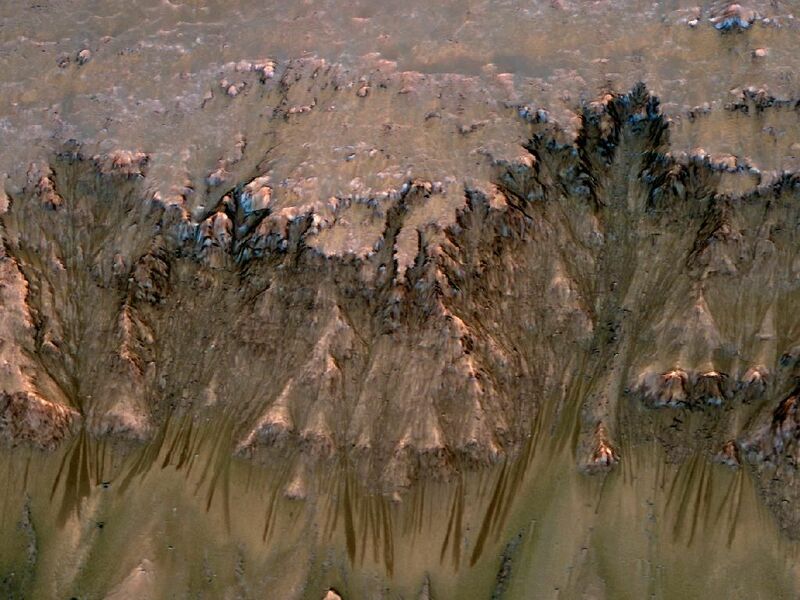 On August 4, 2011, NASA announced that its Mars Reconnaissance Orbiter (MRO) appears to have imaged flowing water during the warmest months on Mars, when peak surface temperatures reach -10 to 80 �F (-23 to 27 �C, or ~250 to 300 kelvin). Found in MRO images since 2007 are dark, "finger-like features" that appear and extend down some steep Martian slopes (of 25� to 40�) during late spring through summer, before fading away in winter, and then return during the following spring. Repeated observations suggest that these seasonal features recur on several steep, equator-facing slopes in the middle latitudes of Mars' southern hemisphere, and the best explanation is that they depict the flow of briny water before full evaporation at the end of each flow. The features depicted in the images are estimated to vary between about 0.5 to 5 yards (or meters) wide and extend up to hundreds of yards (or meters) long. The images were first noted by a student, geophysics junior Lujendra Ojhaat, at the University of Arizona�s Lunar and Planetary Laboratory (NASA news release and science news; Marc Kaufman, Washington Post, August 4, 2011; David Shiga, New Scientist, August 4, 2011; Astronomy Picture of the Day; and McEwen et al, 2011). Larger, jumbo, and other images. northern and southern hemispheres (more). At the March 2009, 40th Lunar and Planetary Science Conference, a team of scientists discussed the discovery of ice lying beneath a layer of dust ("desiccated regolith") in Mar's mid-northern plains in images from the HiRISE camera onboard NASA's Mars Reconnaissance Orbiter (MRO). The craters were found at five sites ranging at latitudes of 43� to 56� north and are estimated to be around 10 to 20 feet (3 to 7 meters) across and a foot or two deep (one- to two-thirds of a meter). 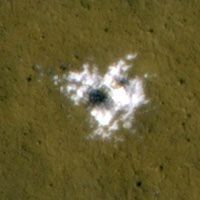 One cluster of impacts probably occurred between between June and August 2008, while a larger excavation may have been produced between January and September 2008. The whitish substance uncovered by the largest impact was confirmed as water ice by the MRO's CRISM instrument through spectrum analysis. 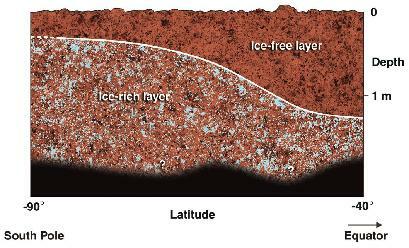 These underlying ice deposits were probably at least two inches (five centimeters) thick, as they were unstable at their mid-latitude locations and so were observed to have subliminated (evaporated) into the Martian atmosphere over a period of months (Bryne et al, 2009; and Kelly Beatty, Sky and Telescope, March 27, 2009). At the March 2009, 40th Lunar and Planetary Science Conference, a team of scientists (including Carlton C. Allen, Dorothy Z. Oehler, and David Baker) discussed the possible discovery of mud volcanoes on Mars that may have been created by subsurface eruptions of liquid water. 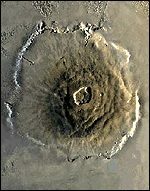 The isolated and overlapping, dome and cone-shaped structures have central craters and have been to shown to overly the surrounding northern plains, and so resemble mud volcanoes seen on Earth in aerial and space images. Infrared images (including color analysis) from space indicate that the Martian mounds are probably composed of fine-grained sedimentary substances (i.e., mud) that cool more quickly at night than surrounding rock, which appear to include minerals such as iron oxides that are formed in the presence of water. If the mounds do turn out to be mud volcanoes, then the clays in their mud may have protected organic molecules (like ammonia and proteins) from any organisms that once lived in watery, surface or underground environments (Allen et al, 2009; David Shiga, New Scientist, March 20, 2009; and Astronomy Picture of the Day). The planet was much more like Earth when it was young and almost all of its carbon dioxide was used up to form carbonate rocks. Without Earth's plate tectonics, however, Mars has been unable to recycle its carbon dioxide back into its atmosphere and so sustain a significant greenhouse effect to retain more solar heat. Hence, the surface of Mars is much colder than the Earth would be at that distance from the Sun. In the distant past, the planet appears to have had a much denser atmosphere with flowing water on the surface because it has physical features that closely resemble lake and ocean shorelines, the gorges of huge rivers and riverbeds, and islands. Clear evidence of erosion is evident in many places on Mars that suggest large areas of flooding and small river systems, but this probably occurred only briefly and very long ago, as the age of the erosion channels is estimated at about four billion years. on the shores of an ancient salty sea, that may have been suitable for Earth-type life (more). giant lake or sea (more). 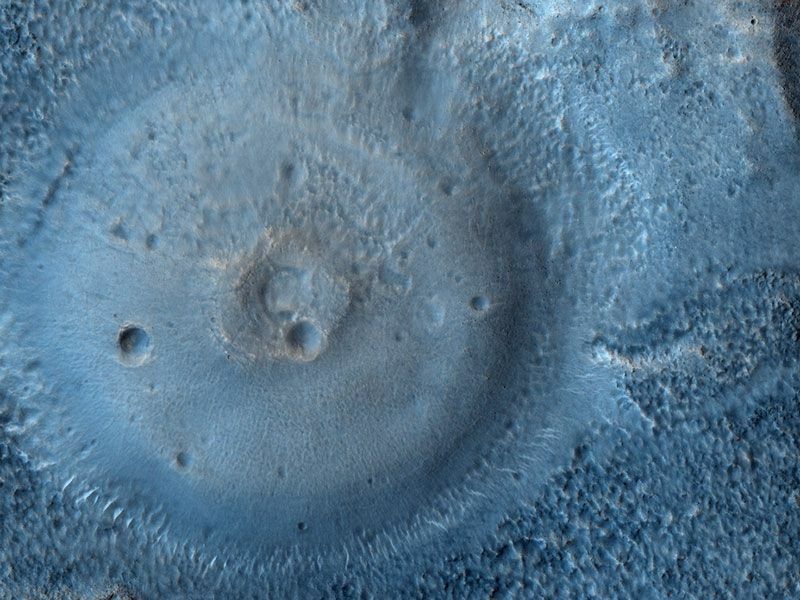 Scientists working on a geological mapping project of Mars have identified sedimentary deposits in the 1,400 mile (2,300-kilometer) wide and 5-mile (8-km) deep Hellas Basin, a very large and ancient crater. 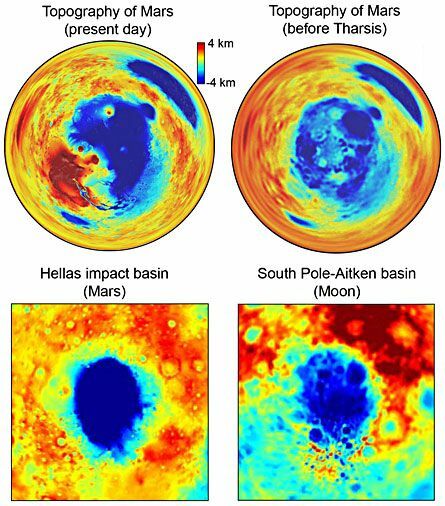 Water drained into Hellas around 4.5 to 3.5 billion years ago during the early to mid-Noachian Period of Mars. The scientists believe that fine-layered outcrops found around the eastern rim of Hellas are likely to be sedimentary deposits, that were formed through the erosion and transport of rock and soil from the Martian highlands into a standing body of water within Hellas (Bob King, Duluth News Tribune, June 9, 2010; BBC News, June 8, 2010; and Bleamaster and Crown, 2010). region (New Scientist and BBC). 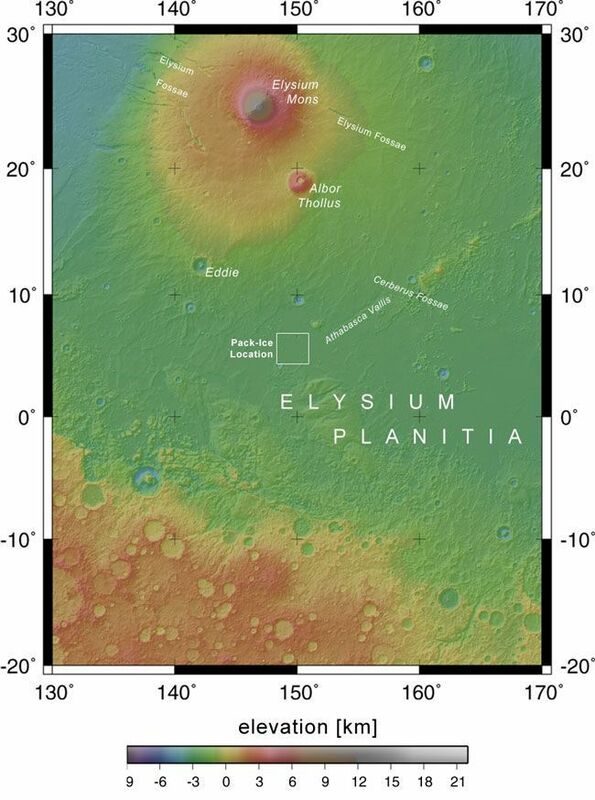 In February 2005, scientists working with the European Space Agency's Mars Express revealed that the orbiting probe had detected a huge frozen sea in the southern portion of Elysium Planitia located near the Martian equator (Murray et al, 2005, in pdf). The pack-ice region in the southern Elysium, five degrees north of the equator, exhibits plated and rutted features across an area measuring roughly 800 by 900 kilometers (497 by 559 miles), which appears to average around 45 meters (nearly 148 feet) in depth. 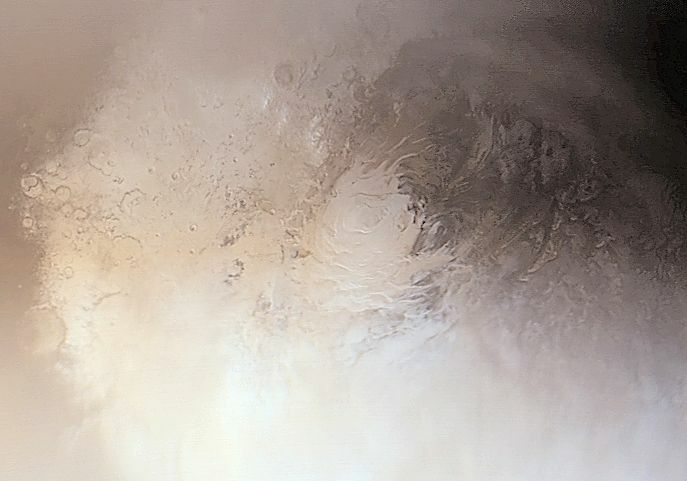 ESA planetary scientists believe that a catastrophic event flooded the region around five million years ago, then pack ice formed on top of that water and broke up, and then the whole area froze rigid. Subsequently, large amounts of dust (possibly volcanic ash) fell over that area, through the water and on top of the pack ice -- protecting it from sublimation and giving it a different hue, while the water evaporated. The water that formed the sea appears to have come from beneath the surface of Mars, erupting from a series of fractures known as the Cerberus Fossae. 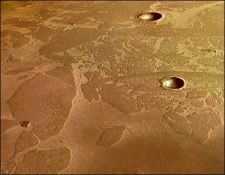 In addition, there are other regions on Mars with similar plate formations that could also be made of dust-covered pack ice (New Scientist and BBC News; Astronomy Picture of the Day; and Murray et al, 2005, in pdf). third of the Martian surface (more). 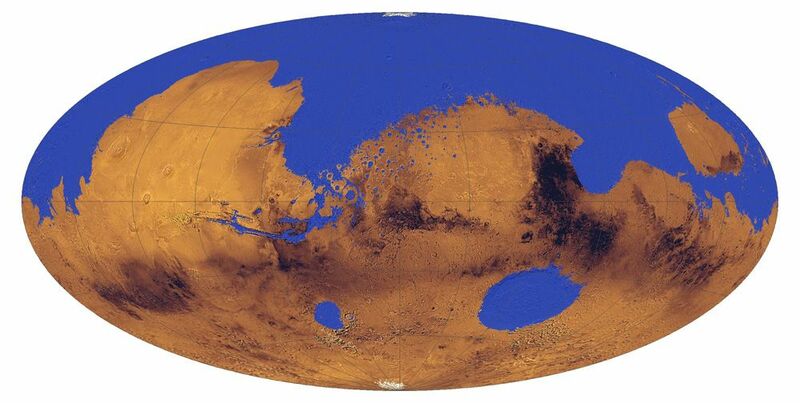 A great ocean once covered slightly over a third of the Martian surface some 3.5 billion years ago, according to a 2010 study by scientists at the University of Colorado in Boulder (CU-Boulder). Although previous studies had proposed the existence of a large, ancient ocean on Mars over the past two decades, the available evidence was repeatedly contested. This new study provides further support for the idea of a sustained sea on the Red Planet within and along the margins of the northern lowlands during Mars' wet and warm Noachan epoch (around 4.1 billion to 3.7 billion years ago), based on global databases of known river delta deposits, valley networks, and present-day Martian topography. In a related study, scientists also detected roughly 40,000 river valleys on Mars, around four times the number of river valleys previously identified. These new findings also support the hypothesis that an ocean formed on early Mars as part of a global and active hydrosphere. The ancient ocean likely covered about 36 percent of the planet and contained around 30 million cubic miles, or 124 million cubic kilometers, of water (the equivalent of a 1,800-foot, or 550-meter-deep layer of water spread out over the entire planet, but still about 10 times less than the current volume of Earth's oceans). (CU-Boulder press releases of June 13, 2010; June 17, 2009; and Di Achille and Hynek, 2010). showing signs of clearing (more information). Today, planet-covering dust storms can develop on a very dry Mars. In late June 2001, a small dust cloud erupted inside the Hellas Basin, a 9-km (5.6-mile) deep impact crater on the planet's southern hemisphere. 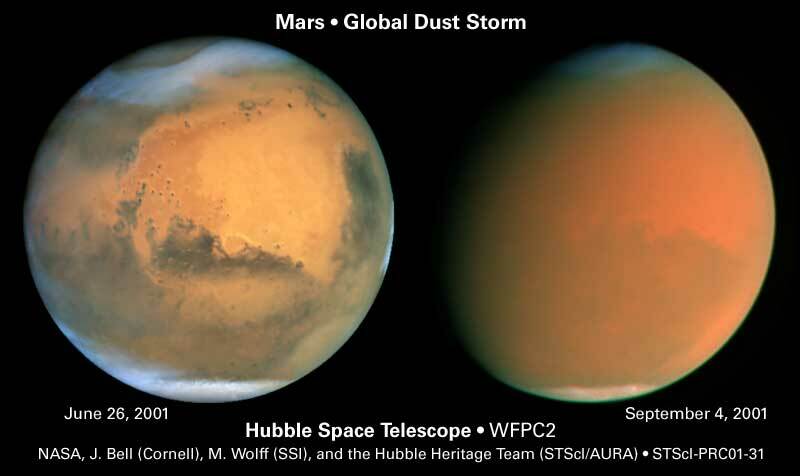 By early July, the storm spilled out of the Basin and wrapped itself around the entire planet within three weeks, shrouding Mars in haze and warming the atmosphere by as much as 30� C.
(Growth of Mars dust storm between June 24 and July 8, 2001 -- more information and movie). One theory is that airborne dust particles warm the local atmosphere by absorbing sunlight. Then, wind is generated as warm air rushes toward colder regions. In a positive feedback loop, strong winds lift even more dust off the ground, which further heats the atmosphere and eventually transforms a small dust cloud into a planet-wide storm. However, once underway, Martian dust storms tend to last last for weeks or months. times wider than it is high. The interior of Mars appears to contain a dense core of about 3,400 km (2,200 miles) in diameter, a molten rocky mantle somewhat denser than the Earth's, and a thin crust. The crust is about 80 km (50 miles) thick in the southern hemisphere but only about 35 km (22 miles) thick in the north. Mars' relatively low density compared to the other terrestrial planets indicates that its core probably contains a relatively large fraction of sulfur in addition to iron (i.e., as iron sulfide). 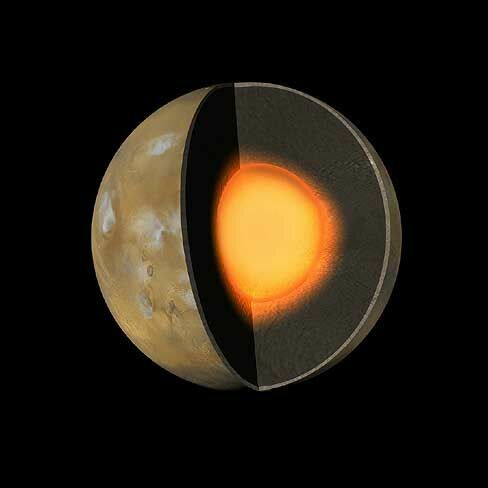 Although scientists now believe that the planet's core still has liquid molten iron in an outer layer, they are uncertain whether the inner core solidified like Earth's (more). 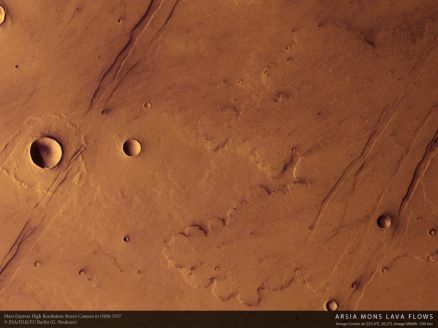 Mars appears to lack active plate tectonics and volcanic activity at present like Mercury and Earth's Moon. 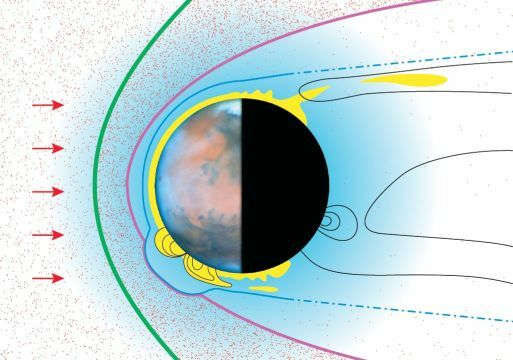 Large but weak, and not global, magnetic fields exist in various regions of Mars which are probably remnants of an earlier global field that has since disappeared. On June 25, 2008, three teams of astronomers announced the publication of separate papers in the June 26, 2008 edition of Nature supporting the hypothesis that Mars has the largest known impact structure (Borealis Basin) in the Solar System, supplanting the Aitken Basin at the Lunar South Pole. First proposed in 1984, the massive elliptical depression in Mars northern hemisphere is partially obscured by the volcanic lava flows of the Tharsis Bulge. It was created by an impact with an object up to over half the size of planet Mercury (between one-tenth and two-thirds the size of Earth's Moon) around 4.4 billion years ago, within 200 million years of planet Mars' formation. Creating a crater four times larger than any other confirmed in the Solar System (around 8,520 by 10,650 kilometers or 5,294 by 6,618 miles across), the impact stripped off 40 percent of Mars' crust and left a surface that is lower, smoother, and less marked by craters than that found in its southern hemisphere (NASA MRO news release; Ashley Yeager, Science News, June 25, 2008; David Shiga, New Scientist, June 25, 2008; Katherine Sanderson, Nature News, June 25, 2008; Andrews-Hanna et al, 2008; and Wilhelms and Squyres, 1984). At the March 2008 Lunar and Planetary Science Conference, planetary scientists used data collected by the European Space Agency's Mars Express mission announced further evidence that beginning about 3.5 billion years ago, Mars experienced five episodes of major volcanic activity. Each episode released massive eruptions of lava and hot water onto the Martian surface lefted identifiable features. 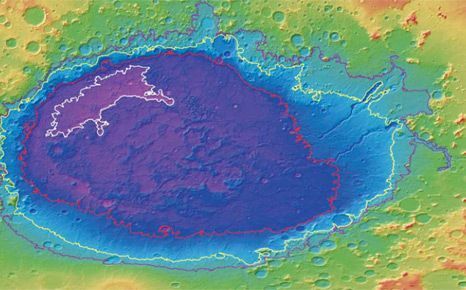 The scientists were able to date each episode by counting the number of small craters subsequently blasted into volcanic terrains created by each episode, by assuming that more craters accumulated on older terrains as meteorites of all sizes bombarded their surfaces over time. Crater analysis allowed the scientists to estimate estimated five major periods of volcanic activity: 3.5 billion years ago, 1.5 billion years ago, between 400 million and 800 million years ago, 200 million years ago, and 100 million years ago. 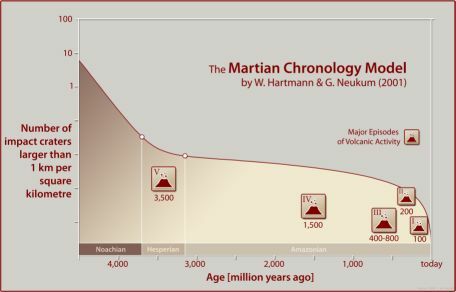 The dates of the earlier episodes have error margins of 100 million to 200 million years, while the later dates are correct to within 20 million to 30 million years. 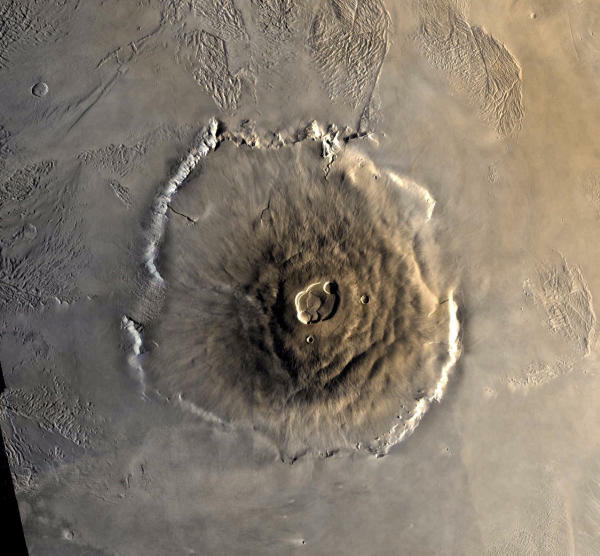 Although the most recent activity on the summit of Olympus Mons, Mars's largest volcano, occurred around 150 million years ago, minor flows in some areas have been detected that are as recent as 2 million years ago. Peaks in eruptions of the volcano match the dates his team found for global volcanic activity. Two large channels, Kasei Valles and Mangala Valles, also provide evidence of episodes of water flow that roughly match the times of high volcanic activity (ESA news release and Hartmann and Neukum, 2001). 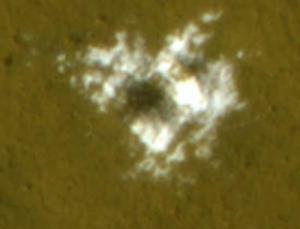 On September 3, 2010, scientists working on data and experiments prompted by the findings of the 2008 NASA Phoenix Lander announced that soil examined by NASA's two Viking landers in 1976 may have contained "carbon-based chemical building blocks of life" (commonly called "organic compounds") (NASA news release; and Navarro-Gonalez et al, 2010). 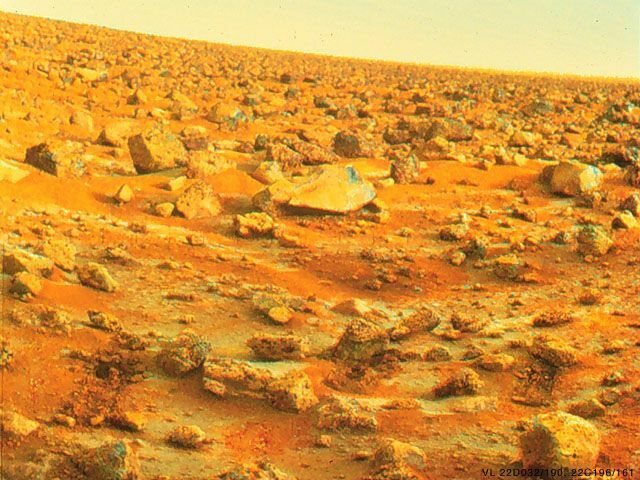 The Viking landers had heated Martian soil samples and detected the organic compounds chloromethane (methyl chloride or CH3Cl) and dichloromethane (methylene chloride, methylene dichloride, or CH2Cl2), but these chlorine compounds were interpreted at the time as likely contaminants from cleaning fluids used on Earth. Since 2008, however, scientists have determined that those chemical compounds are also detected when a little perchlorate (ions of salts containing chlorine and oxygen which were found in the Martian Arctic's ice-rich soil by Phoenix, but which would have destroyed many organic compounds in chemical reactions when heated) was added to what is believed to be the Earth's most comparable soil from the dry, cold, and often salty Atacama Desert in Chile containing trace organics and perchlorates and analyzed in the manner of the Viking tests. on the Red Planet (more). The new, post-Phoenix experiments suggest that both organic compounds and perchlorate may have been present in similar Martian soils found at both Viking landing sites (at Chryse Planitia in Mars' northern equatorial region east of Tharsis for Viking 1 and at Utopia Planitia in Mars' southern highlands at the antipode of Argyre, which is one of Mars' largest recognizable impact regions, for Viking 2). Organic compounds, however, can come from non-biological as well as biological sources, and meteorites falling onto Mars and Earth over the past 4.6 billion years have brought organics to both planets. Hence, the Viking landers would have been expected to find organic compounds even if Mars has never developed any carbon-based lifeforms. These new findings are critical to the design of NASA's 2011 Mars Science Laboratory mission, which is designed specifically to find organic compounds on the Red Planet. 2008 jumbo image (from NASA MRO / HiRISE). Mars as well as Earth (more). On September 20, 2010, scientists analyzing data from the ESA's Mars Express and from NASA�s Mars Global Surveyor) spacecraft announced at the 2010 European Planetary Science Congress that Mars' biggest moon, Phobos, appears to be partially composed of rocks found on the planet's surface. Hence, the satellite may be composed of material ejected from the Martian surface during a catastrophic impact with an asteroid which later clumped together. 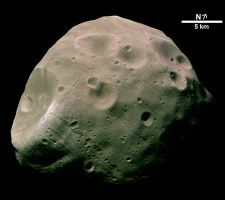 Although previous observations of Phobos at visible and near-infrared wavelengths suggested the presence of carbonaceous chondrites that have also fallen on Earth as meteorites, new observations in thermal, far infrared wavelengths using the Planetary Fourier Spectrometer instrument onboard Mars Express detected the presence of the phyllosilicate minerals on the surface of Phobos, particularly in areas northeast of Stickney, its largest impact crater. 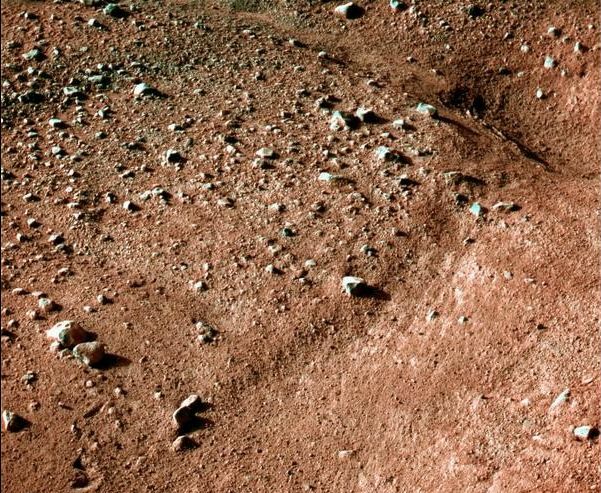 On Earth, phyllosilicate rocks typically form in the presence of water, and these minerals also have been found on Mars. Previous asteroid capture models have had problems explaining the current near-circular and near-equatorial orbit of both Martian moons, and the density of Phobos has been estimated to be significantly lower than the density of meteorites associated with asteroids, indicating that the moom has a sponge-like structure with voids comprising 25 to 45 percent of its interior using the Mars Radio Science Experiment on board Mars Express. The scientists believe that a highly porous asteroid probably would have not survived if captured by Mars (Europlanet press release; Nancy Atkinson, Universe Today, September 21, 2010; Stephen Battersby, New Scientist, September 21, 2010; BBC News, September 20, 2010; and SIFY News, September 21, 2010). Larger, jumbo, and two-sided images. 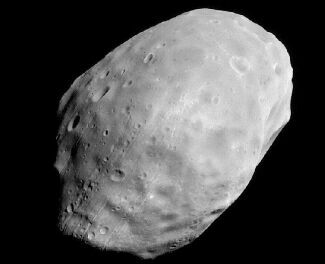 Like Phobos, the outer moon, Deimos, has a near-circular and equatorial orbit around Mars, which suggests that it may also have formed from an ancient asteroidal impact that raised a lot of rock from the Martian surface Astronomy Picture of the Day). 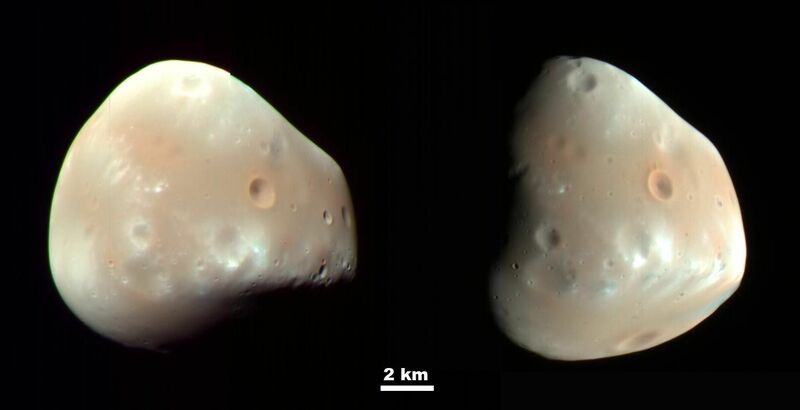 Both Deimos and Phobos are saturated with craters. Deimos has a smoother appearance from partial filling of some craters, while Phobos shows striated patterns which are probably cracks resulting from the impact that produced its largest crater, Stickney -- the maiden name of the wife of astronomer Asaph Hall (1829-1907; portrait) who discovered the two satellites in 1877.
around a meter, or yard, deep (more). Based on recent images taken by the Mars Global Surveyor, planetary scientists have determined that Phobos appears to be covered by perhaps a meter (or yard) of loose dust. 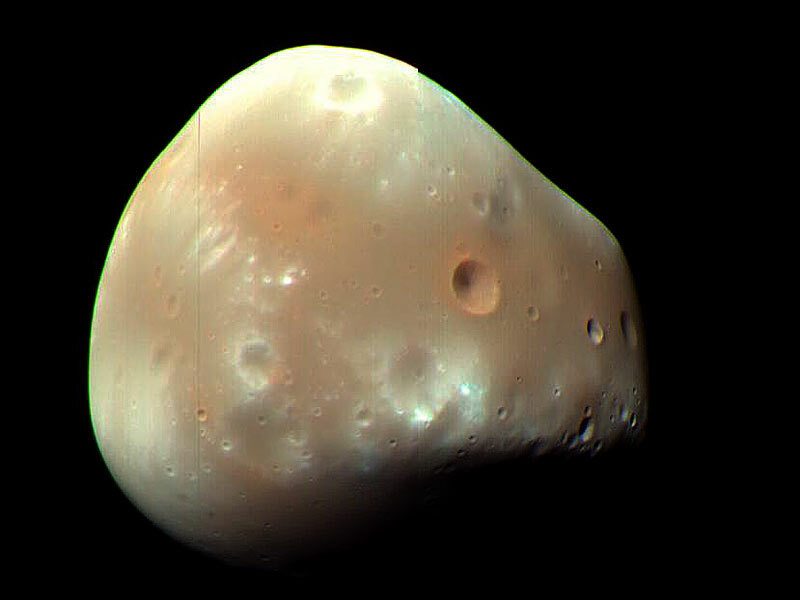 Phobos has a much closer orbit around Mars than Deimos. The satellite orbits so close to Mars that from some places it would appear to rise and set twice a day, although it would not be visible at all from other Martian locales. 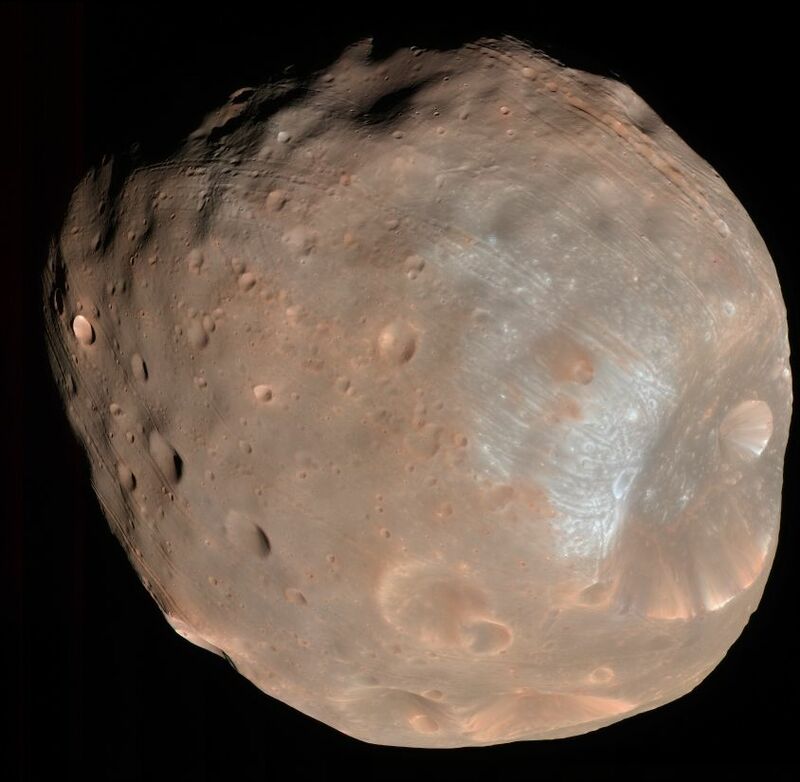 As Phobos' orbit is continually decaying, however, the satellite may break up and fall down to the Martian surface within around 50 million years. around 50 million years (more). Since 1990, astronomers have also discovered at least six objects that share a similar orbit with Mars. A list of these Martian "Trojans" objects and their orbital characteristics is available from the IAU. The first Trojan associated with Jupiter was discovered in 1906, and about 1,600 such objects are now known. Further discussion on these "Trojans Asteroids" is available from the Spaceguard Foundation. Information and images about proposals to explore, settle, and Terraform Mars can be found at Sol Station. 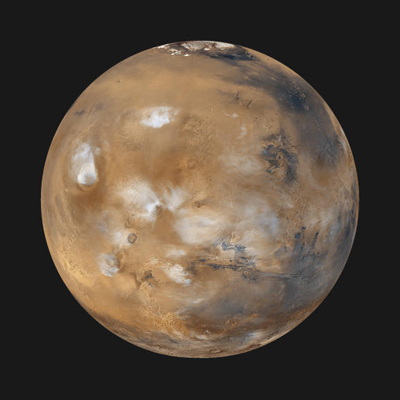 More information, images, animations, and artwork about the planet Mars are available from NASA's: Mars Exploration web site; Lunar and Planetary Institute; and Planetary Photojournal. In addition, over 57,500 photos taken by the Mars Global Survey since September 1997 are available from Malin Space Science Systems. A fact sheet on Mars is also available from NASA's National Space Science Data Center. David Seal (a mission planner and engineer at NASA's Jet Propulsion Laboratory at CalTech) has a web site that generates simulated images of the Sun, planets, and major moons from different perspectives and at different times of the year. Try his Solar System Simulator. For more information about the Solar System, go to William A. Arnett's website on "The Nine Planets", or to Calvin J. Hamilton's web page on "Mars". © 1998-2012 Sol Company. All Rights Reserved.